While it was written before the topics of global warming and rising sea-level became front-page headlines, this story could well be viewed as a thought experiment about man’s coming confrontation with climate change. 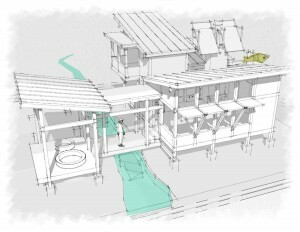 The story evolves around a national competition to design a utopian community to relocate a city which has been flooded out of viable existence. Since we are going to build new, shouldn’t we think of a new and better way to build urban habitats? And what forces would try to stand in the way of accomplishing that? These questions are dramatized in the coming of age experience of Charlie Cadwell―a young man whose architect-father mysteriously disappeared after returning from the Vietnam war. 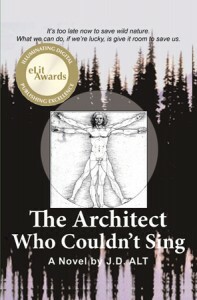 The circumstances of this disappearance, and the father’s sudden resurfacing as one of the short-listed winners of the design competition, sets the stage for an epic challenge in Charlie’s life―and an achingly beautiful romantic adventure―that changes the “course and trajectory and purpose” of his existence. Charlie’s “unit” at the Fish Camp.